(Newser) – A California mayor has been charged with secretly recording a strip poker game featuring at least one 16-year-old, Reuters reports. 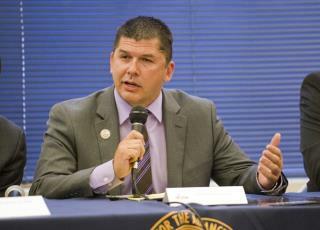 The incident allegedly took place last August in Stockton mayor Anthony Silva's bedroom at the summer camp he runs for inner-city kids in need. According to the Los Angeles Times, Silva was arrested at the camp on Thursday. Prosecutors say Silva started recording the strip poker game with his cellphone then immediately set the phone down, leaving only a dark screen with audio. But they say the audio makes it clear the participants, one of whom was a 16-year-old boy, were naked and did not want to be recorded. Pedophiles believe they care for the victims of their sexual perversity. Will be interesting to see if victims come forward. Sicko. Hopefully all the rest of his prior victims come forward. Interesting story that was made even more interesting to me by Brushman apparently defending the mayor. As I was reading through the rest of the comments I ran across a link shared by The Watchman (http://mayorsilva.org) that has a video on it of the Mayor's camp. Seems like it was a wonderful experience for a lot of the kids involved. This makes me wonder about the mayor. Judging strictly by the video, he appears to me to be someone who genuinely cares about and is very able to relate to kids and young adults. I'm curious about a few things; How far along was the poker game as far as people shedding clothes? Was it just boys or boys and girls? Was the mayor videoing for lascivious motivations or was this all in fun and/or everyone was actually clothed? Was the mayor aware of the fact there was "at least one" 16 year old or did he believe everyone was at least 18 and therefor all legally adults? The article says underage - do they mean under 18 or under 21? When he put the phone down did he think he had turned it off? Who wants audio of a strip poker game? I hope this was all just innocent fun. There will be a lot of kids in this community heartbroken if it turns out the mayor was a guy of bad intent.